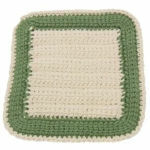 Mitten Potholder -- $1.99 A Crochet pattern from Julie A Bolduc. This potholder is made so that you can use it in 3 different ways. As an oven mitt as a pair of mittens if made with acrylic yarn or as a mitten shaped potholder. I have included instructions for larger sizes and an alternate foundation row.